Do you have an existing utility line that crosses under a railroad? Or, does your utility need to extend a new utility line underneath a railroad to improve service? Quite often utility departments need to either replace or extend a new utility pipe underneath railroad tracks to provide or maintain reliable service to its customers. Railroads require a permit to cross under their facilities. The process to obtain a permit for construction underneath a railroad can often be a daunting task. Wessler Engineering recently contacted Derek Sublette from Norfolk Southern Corporation to obtain some answers to commonly asked questions when crossing under a railroad with a utility line. Wessler: What is the amount of liability insurance required by a contractor for utility installations (water, sewer, etc.) that will cross underneath a railroad line? Derek: These requirements will be defined in the agreement but generally include payment of a risk financing fee per installation. Such fee will be in an amount to satisfy the railroad protective liability insurance requirement in its entirety for the project. Additionally, a Certificate of Liability Insurance that evidences a combined single limit minimum of coverage (typically $1,000,000 per occurrence) of general liability will be required. The certificate should name the railroad as the certificate holder and the certificate holder as an additional insured. Wessler: When are railroad flagmen required to be present during the utility installations? Is there any cost to the owner of the project for these flagmen? Derek: Entries on railroad property will require a right-of-entry. Additionally, a railroad flagman must be present if the parties are within 25 feet of a railroad track. If this is the case, a cost per day for the flagman should be considered for your project budget (typically $500 per day). Wessler: Is there an online source or individual to contact to determine railroad mile markers? Derek: The application for construction on railroad property requires the applicant to provide a specific location of the proposed construction. The railroad must have a permanent record of the facility location, based upon railroad mileposts and valuation map stationing and, if available, GPS latitude and longitude information. It is recognized that applicants not doing work on behalf of the railroad will likely not have access to milepost information. Therefore, to assist the application process, the location plan should include the distance from a centerline of the nearest street grade crossing or bridge to the proposed facility. Applicants should also identify the AARDOT Number of the nearest public grade crossing. All public rail-highway crossings have a unique number assigned in a format such as 123 456B. A metal tag indicating the number is located on the crossbuck or flasher post at the crossing. 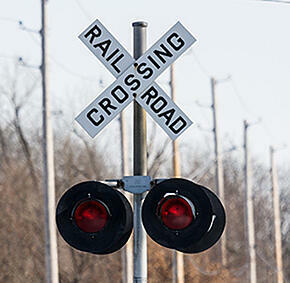 Wessler: What is the railroad fee for a utility crossing outside of the public right-of-way? Derek: These fees are assessed on a case by-case-basis but according to a standardized methodology. Applicants may obtain an estimation of the applicable charges by corresponding with a railroad representative or a vendor to the railroad that handles such requests. Wessler: When is a casing pipe required for utility installations underneath railroads? Derek: A casing pipe will be required across the entire width of railroad right-of-way for all pipeline crossings carrying flammable or non-flammable liquid substances under pressure. The casing pipe may be omitted for non-pressure sewer or drainage crossings where the installation can be made by open cut. Pressure pipelines that do not cross under tracks, but are located within 25 feet of the centerline of a track, should be encased. The Indiana Department of Transportation (INDOT) provides this useful map, which shows all Indiana railroads, their routes, and respective owners. Coordination with railroads for utility crossings is essential for normal operation and protection of both railroad infrastructure and municipal or private utility assets. Early coordination between both parties is necessary to provide adequate review time and ensure the project is completed on time and within budget. Derek Sublette is Manager, Government Relations, at Norfolk Southern Corporation. The Government Relations Department is the voice of the Norfolk Southern Corporation on Capitol Hill and state capitols across Norfolk Southern’ s twenty-two state territory. The Government Relations Department works closely with federal and state legislators and their staffs, the Executive Branch, and independent agencies.